How to win with opposite-colored bishops? First, let me remind you of the survey we’re conducting to know your opinion about the next RCA course. The survey is very short and contains only THREE questions. It won’t take more than a minute or two for you to complete it. 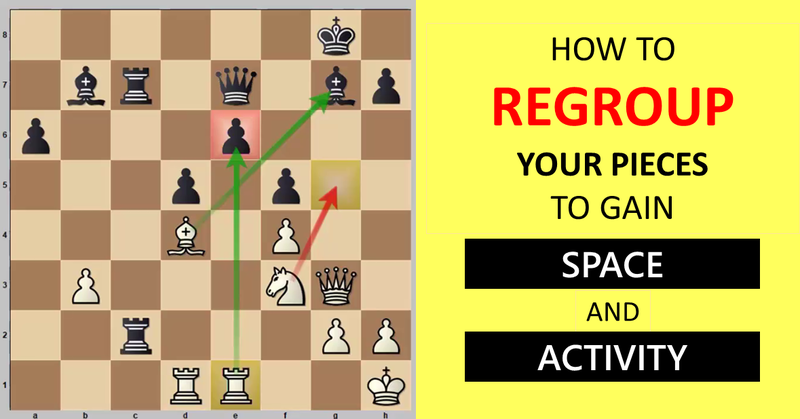 You will get one of our popular premium videos “Chess opening disasters” by IM Alex Kundin (worth $10) for FREE in return! Find more details and participate in the survey now here. Today, I’d like to introduce GM Sergey Kasparov to you. 🙂 He has prepared a video lesson on opposite-colored bishops. By opposite-colored bishops, I mean the situation on the board where one side has a dark-squared bishop and the other side a light-squared bishop. The endgame with opposite-colored bishops is a draw because the defensive side can blockade the passed pawn very well. Sometimes the position is a draw even if one side is two or even three (!) pawns up. Useful rule: In order to break the blockade, you need to destroy the coordination of the defensive pieces. In the above diagram, black can successfully blockade the pawns but not both of them simultaneously. White’s plan is very simple. He will place the king on f6 and then advance the g-pawn. Sooner or later, Black will be forced to give up his bishop for the g-pawn. White can then win afterwards. It is possible to have other pieces on the board. For example, if both sides have one or more pieces, then the evaluation of the position can change (like in the above example). You can watch and download the PGNs of all games mentioned in the video here. Sergey Kasparov is a Belarusian grandmaster since 2007. He is currently rated 2475 (standard) and his blitz rating is 2491! His peak rating was 2546 ELO in 1 January 2007, and he held the 5th place among Belarusian chess players. at 8:07 pawn structure is nice for Black. Why? He has 3 pawn Islands and a double pawn on the f-file. – White’s pawn majority on the queen-side is blocked, and can’t be used to create a passed pawn. – Black’s doubled f-pawn provides Black with a powerful outpost square e3 (for his rook or Bishop). – Finally, White’s bishop has no job to do, and it’s even difficult to relocate it to any more active square. Hopefully, this helps. Anyhow, you are right in a way: if we imagine a pawn endgame with the same pawn structure – it may favor White. However, in the given position, White has no way to trade off all the pieces. Guys, what do you think about Sergey Kasparov? He’s a new author in RCA, and I would appreciate your feedback about him. Would you like more lessons from him? Do you understand his English clearly? When I click to watch the opposite-colour bishops video, I get an error message. Is it just my computer, or is something wrong? It is working for me. Could you please try again? Maybe you can clear your browser cache or use different browser. I’ve asked some question book Opening Preparation already on RCA website. However I’d like to ask it again in different form. I’m actively studying Igor’s courses, Positional Understanding, Opening Laboratory, and GM’s Secrets and other courses and I’d like to ask something. My friend suggested me to read ‘Opening Preparation’ book by Dvoretsky and Yusupov. He said that this book will clarify me a lot. I started reading it, and I must tell you Igor, that the approach is A LOT different from what you teach in GM Secrets and Opening Laboratory course. He emphasizes the importance of planning in the opening, importance of understanding the structure, how do we want to steer the game, prohylaxis and so on… Because in your courses you are kind of oversymplfying it I reckon. You said that in the opening we just develop and follow couple of basic strategical principles regarding the base idea activity, and that it is kind of it. The book is a lot different and explains a lot. Example, in the main line gruenfeld after Nxc3 bxc3 and Bg7 we arrive at the position where we already need to deeply understand pawn structure, and the plans. For example, according to you, white should just slam Nf3 on the board without thinking. However, according to what I’ve learned/am learning with the book, we should think more deeply, right? IM Danny Rensch also emphasizes this a lot. He says that thinking in a way:”oh let me just get my pieces out, to the most active squares and then I’ll figure out what do to next” is a wrong approach.However, this is exactly your approach! Just develop pieces to active squares, and compose middlegame plan afterwards. However, he says that we need to think about the deeper, bigger picture of the position of the opening, every fine chess player knows that he’s going to get killed if he doesn’t develop. All this made me question your approach a lot. So my question is, what do you think about all this and what do you think I should do, study, how should I approach? Thanks for your attention in advance, Igor, I highly appreciate it. It seems that you listen lot of IM Daniel’s commentary :). I will save this question. GM Igor is busy so he may answer it later. 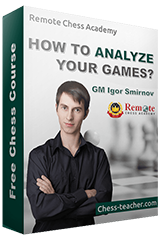 There is a chance to get a 1 hour session with GM Igor. To participate in that contest and know more about it, click the link below.